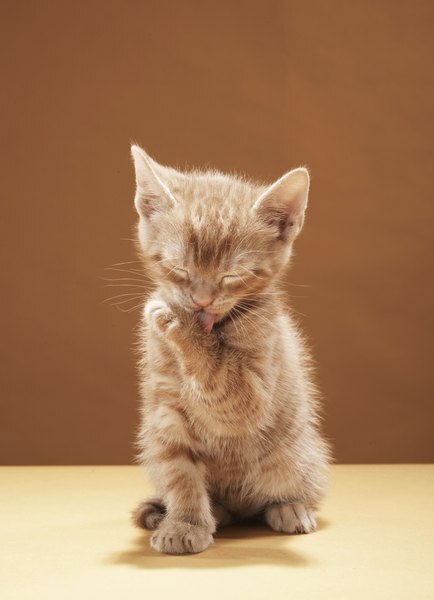 Keep your kitten safe and sound -- indoors. Kittens are tiny little creatures -- as fragile and delicate as they are adorable. Not to mention, the wee things are often clumsy and confused. Going outdoors is dangerous enough for a savvy adult cat, so it is doubly important to make sure your kitty stays indoors -- always! Allow your kitten to get the feel of the outdoors -- artificially. Even from a young age, kittens may display predatory patterns that urge them to go outside. Emulate the concept for your little one so her desire to go out isn't as strong. For example, get her interactive toys that simulate bird motions. Show your kitten wildlife documentaries that depict the behaviors of birds, rats, mice -- anything that may hold her fancy! Ensure that your doors and windows are foolproof. Cats are crafty beings, even as wee kittens. If kitty is determined to get outside, she will be as tenacious as can be. Never be casual about the security and reliability of your home's doors and windows. Double-check everything -- from the locking mechanism of your doors to whether your windows screens are sturdy enough. Cats are strong! Discourage your kitten from going outside -- right at the door. Deter your curious kitten from venturing outside by making the thought of going outside unappealing. Perhaps purchase a sound alarm that goes out when it detects motion. The annoying and loud sound will likely keep your cat away from the door, but if you notice that she it is stressing her out or scaring her, you may want to remove it. Consider an enclosure. If you want your sweet dear to experience the outdoors without any of the risk, try an enclosure that is secure from every side. Be sure that the enclosure is high enough so that kitty can't jump over it. For extra safety, always monitor her as she enjoys the fresh air. If she gets a little bit of the outside experience, it may curb her desire to escape -- phew. Power exists in numbers. Recruit the help of your family in monitoring your kitten's attempts to escape to the great outdoors. Make sure everyone in your home knows to always look around before opening doors and windows -- and also to do these things very carefully and slowly! If you allow your kitten outdoors at a young age, it will encourage the desire to do so as she gets older. To stay on the safe side, keep your kitten indoors always -- no matter what. From cars to other animals, the outdoors simply isn't a safe and happy place for felines big and small. Is It Cruel to Keep a Cat Indoors? What Can Be Done for Kittens With Diarrhea?